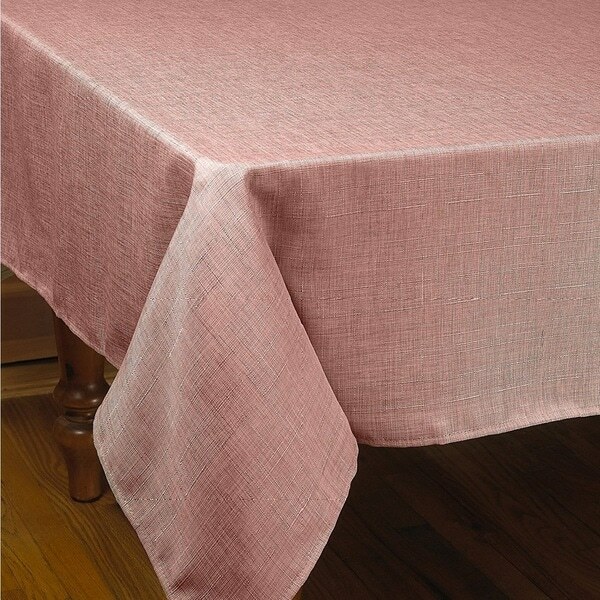 Beautiful linen tablecloth that just drape the table elegantly. I have the oatmeal and the mint green and have gotten many compliments on the quality of the tablecloths. Tablecloths this beautiful, I plan to buy all colors. While not the fanciest tablecloth, this was a great find -- an extra long tablecloth that doesn't cost a fortune! I felt that our flatware was snagging it at times, but there is no damage to be found. The mint color is closer to spring green or a light sage, which is what I was hoping for. I would buy it in white if it came in the 140" version. I bought the white Linen and it arrived today; on-time, as is usual with Overstock. The product is nice, a bit thin, and the finishing is OK - could be a bit better, but for the price, I can't complain. This is a tablecloth for everyday use and not intended for any other purpose. I am happy with the product. Very attractive texture and weight. Initially ordered oatmeal color, which was very golden beige. Returned and reordered gray color. Much better with my taupe interior. Would definitely recommend. I love this tablecloth, it has a very rich coloring (gray) and texture. Looks expensive. The material is not stain free. I treated the stain when it happened then washed it. The stain is still there. Very disappointed. Nice fabric! Very pleased with product. "Is the Cranberry colored tablecloth as pictured - almost mauve in color?" Going to be used as an underlay for a Bridesmaid Luncheon.